No reports are available in the literature regarding the relationship between occupational health hazards and serum total IgE among workers involved in waste disposal area. The present study was undertaken to evaluate the relationship between occupational health hazards and serum total IgE among workers involved in hazardous waste disposal area. The survey was performed in 180 study subjects working in hazardous waste areas of Bangalore at Karnataka, India during the year 2009. These subjects were categorized into three groups. The first group consisted of 60 subjects occupied in landfill disposal area, the second group consisted of 60 subjects engaged in compost process and the third group consisted of 60 office workers with no exposure of biological hazards from waste disposal area as control group. Ethical committee of center approved the study. Informed consent was obtained from each of study participants. 2 ml of whole blood was collected from each subject in test tubes and centrifuged at 3000 rpm for 10 min at 4 o C and serum was separated used for the determination of immunoglobin -E concentration. The concentrations of serum total immunoglobin-E were measured in workers involved in hazardous waste management area by using with enzyme-linked immunosorbent assay (ELISA) kits (DRG International Inc, USA). The absorbance of standards and samples were measured by using Thermo Scientific Multiskan EX-reader (USA) at 450nm. Taking the mean of the duplicate readings and subtracting the absorbance of the average zero standards measured the absorbance of each standards and samples. Plot the standard curve with standard concentration on the X-axis and absorbance on the Y-axis. The concentration of each sample was calculated by using standard curve. The levels of serum total immunoglobin-E expressed as IU/ml. The levels of serum total immunoglobin-E were expressed as geometric mean (GM). 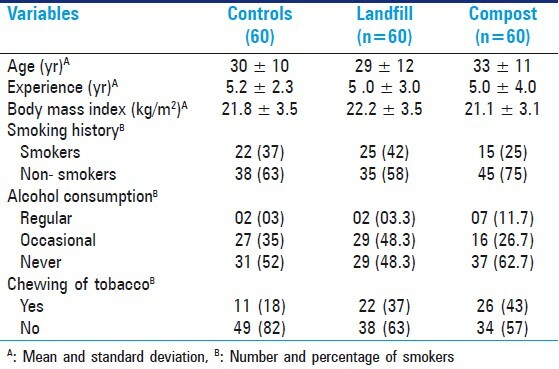 The proportion of morbidity conditions among waste disposal workers and controls were compared by using F-test. The differences of serum total immunoglobin-E between groups were computed by using non-parametric Mann Whitney-U test. P-value < 0.05 was considered as significant. SPSS 10.0 for windows version of statistical software was used in the analysis. The demographic details of mean age, experience, body mass index (BMI) and frequency distribution of life style confounding factors (smoking, alcohol consumption and chewing of tobacco products) of study subjects is shown in [Table 1]. 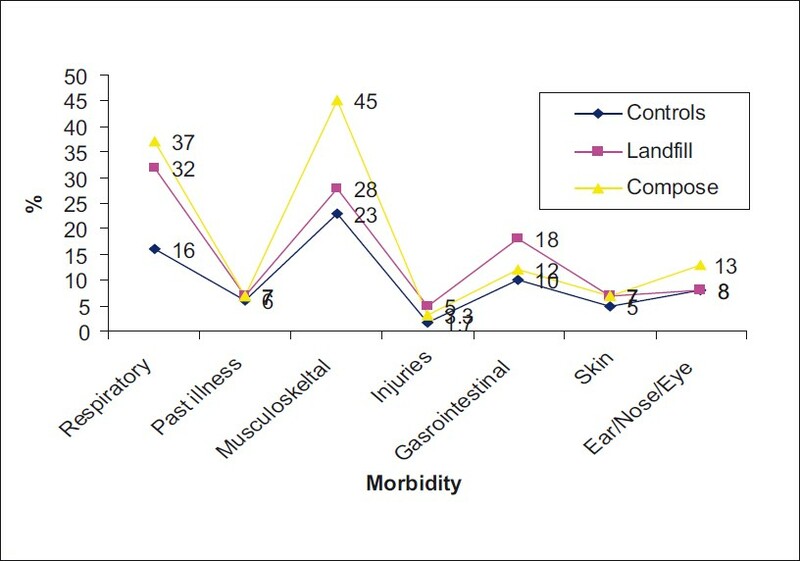 The morbidity conditions of solid waste workers occupied in landfill area, compost and administrative sections were reported in [Figure 1]. The respiratory complaints were significantly increased in land fill area (P=0.006) and compose plant workers (P=0.0006) as compared to controls. The musculoskeletal complaints were significantly increased in compose plant workers (P=0.0008) as compared to controls. The other health hazards were not shown any significant difference among waste disposal workers when compared to controls. The geometric mean levels of serum total immunoglobin-E in subjects according to job category are presented in [Figure 2] The levels of serum total IgE level was significantly increased in landfill area workers (P=0.027) compose plant workers (P=0.020) as compared to controls. The levels of serum total IgE was increased by 28.3% in landfill area workers and 30.8% in compose plant workers as compared to controls. Highest increase was noticed in compose plant workers as compared to land fill area workers. 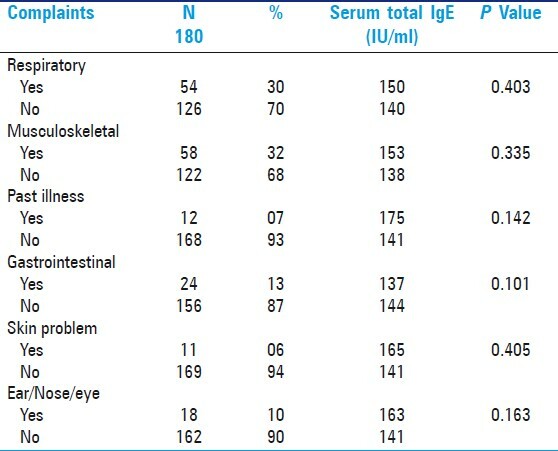 The levels of serum total immunoglobin-E in subjects according to occurrence of morbidly conditions in hazardous waste management area are reported in [Table 2]. The serum total IgE levels were increased in the subjects having health related symptoms as compared to no symptoms. The results of study found no significant relationship was found between the levels of serum total IgE and occurrence of health related symptoms or past respiratory disease. The present study assessed the relationship between occupational health hazards and serum total immunoglobin-E in workers engaged in hazardous waste area. The occupational health hazards reported as respiratory followed by musculo-skeletal, dermatological, gastrointestinal, injuries and nose and eye problems. The highest occupational health complaint was found as respiratory system. Bunger et al, reported 24% respiratory, 13.8% skin and 7% of gastrointestinal complaints in hazardous waste workers (HWW) who had 3 years of mean duration of exposure. The present study has reported higher health complaints in HWW because they had 5 years of mean duration of exposure. Vrijheld et al, have reported health complaints such as headaches, sleepiness, respiratory, psychological, gastrointestinal, cancers, adverse pregnancy outcomes, abnormalities in liver and renal function of workers exposed from landfill area. Goorah et al, have reported respiratory symptoms such as bronchitis 26.1%, COPD 15.1% and asthma 13%, 26.9% of skin irritation, 19.9% nasal irritation, 22.9% eye irritation and gastrointestinal problems (5.25% diarrhea, 11.1% constipation, 10.3% abdominal pain, 14.9% vomiting and nausea) in landfill area workers from Mare chicose in Mauritius with 30 years of exposure. Most of the studies indicated that the workers involved in these hazardous waste industries are exposed to high levels of microorganisms' causes higher prevalence of respiratory symptoms and airways inflammation. , The present study also indicated higher level of respiratory symptoms as compared to other health hazards. Coenen et al, have reported significant association between high endotoxin exposure (72 EU/m 3 ) and serum concentration of IgG in waste collectors. Wouters et al, have reported 27% increased levels of serum total IgE in waste collectors involved in municipal waste collecting facility at Dutch cities. Marth et al, also reported higher levels of serum total IgE in employs engaged in waste sorting facility. In the present study we undertaken to find out the relationship between occurrence of health hazards and serum total IgE in workers involved in waste disposal sites. We found that the levels of serum total IgE were significantly increased in land fill area and compose plant workers as compared to controls. Skorska et al, have reported significantly increased levels of serum total IgE in workers occupationally exposed to organic dust from hatchery process and found non- significant relationship between the levels of serum total IgE and occurrence of health related symptoms or past respiratory disease. In the present we also found increased levels of serum total IgE in land fill area and compose plant workers and no significant relationship was found between the levels of serum total IgE and occurrence of health related symptoms or past respiratory disease. The levels of serum total in land fill area and compose plant workers but no significant relationship was found between the levels of serum total IgE and occurrence of health related symptoms or past respiratory disease. 1. Krajewski JA, Tarkowski S, Cyprowski M, Buczynska A. Characteristics of jobs and workers employed in municipal waste collection and disposal by the city of Lodz. Med Pr 2000;51:615-24. 2. Babu BV, Ramakrishna V. Hazardous waste management in India. Available from: http://www.discovery.bits-pilani.ac.in/~bvbabu/HWM-DMCH2003.pdf [Last accessed on 2012 Jan 29]. 3. Zeng Y, Trauth KM, Peyton RL, Banerji SK. Characterization of solid waste disposed at Columbia Sanitary Landfill in Missouri. Waste Manag Res 2005;23:62-71. 4. Boadi KO, Kuitunen M. Environmental and health impacts of household solid waste handling and disposal practices in third world cities: The case of the Accra Metropolitan Area, Ghana. J Environ Health 2005;68:32-6. 5. United Nations Environment Programme. "International Sourcebook on Environmentally Sound Technologies (ESTs) for Municipal Solid Waste Management (MSWM)." Technical Publication No. 6.UNEP/DTIE/IETC. Nov1996. 6. Perez HR, Arthur L, Frank, Zimmerman NJ. Reviews: Health effects associated with organic dust exposure during the handling of municipal solid waste. Indoor Built Environ 2006;15:207-12. 7. Ray MR, Roychoudhury S, Mukherjee G, Roy S, Lahiri T. Respiratory and general health impairments of workers employed in a municipal solid waste disposal at an open landfill site in Delhi. Int J Hyg Environ Health 2005;208:255-62. 8. Roy S, Ray MR, Basu C, Lahiri P, Lahiri T. Abundance of siderophages in sputum: indicator of an adverse lung reaction to air pollution. Acta Cytol 2001;45: 958-64. 9. Dorevitch S, Marder D. Occupational hazards of municipal solid waste workers. Occup Med 2001;16:125-33. 10. Yang CY, Chang WT, Chuang HY, Tsai SS, Wu TN, Sung FC. Adverse health effects among household waste collectors in Taiwan. Environ Res 2001;85:195-9. 11. Sigsgaard T. Health hazards to waste management workers in Denmark. Schriftenr Ver Wasser Boden Lufthyg 1999;104:563-8. 12. Hertzman C, Hayes M, Singer J, Highland J. Upper Ottawa street landfill site health study. Environ Health Perspect 1987;75:173-95. 13. Fender H, Wolf G. Cytogenetic investigations in employees from waste disposal sites. Toxicol Lett 1998;96:149-54. 14. Rushton L. Health hazards and waste management. Br Med Bull 2003;68:183-97. 15. Wouters IM, Spaan S, Douwes J, Doekes G, Heederik D. Overview of personal occupational exposure levels to inhalable dust, endotoxin, â(1-3)-glucan and fungal extracellular polysaccharides in the waste management chain. Ann Occup Hyg 2006;50:39-53. 16. Lis DO, Ulfig K, Wlazlo A, Pastuszka JS. 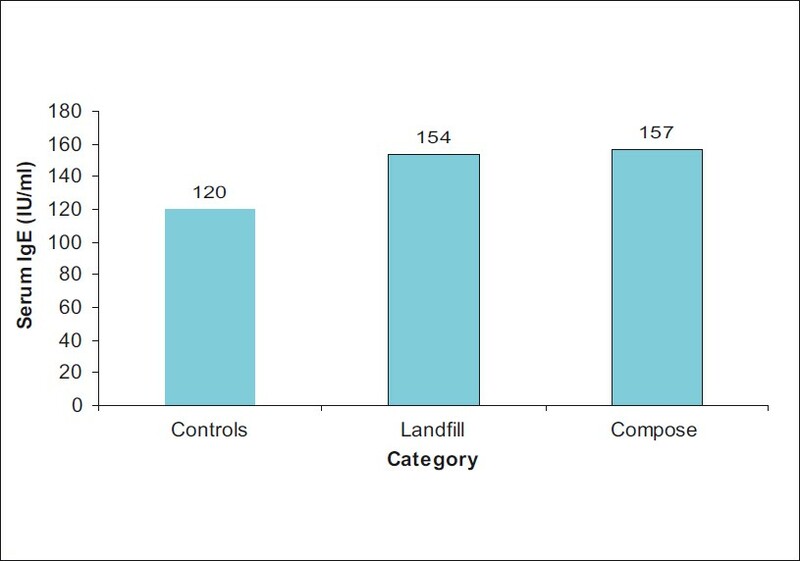 Microbial air quality in offices at municipal landfills. J Occup Environ Hyg 2004;1:62-8. 17. Krajewski JA, Tarkowski S, Cyprowski M, Szarapinska-Kwaszewska J, Dudkiewicz B. Occupational exposure to organic dust associated with municipal waste collection and management. Int J Occup Med Environ Health 2002;15:289-301. 18. Kiviranta H, Tuomainen A, Reiman M, Laitinen S, Nevalainen A, Liesivuori J. Exposure to airborne microorganisms and volatile organic compounds in different types of waste handling. Ann Agric Environ Med 1999;6:39-44. 19. Thorn J, Beijer L, Rylander R. Airways inflammation and glucan exposure among household waste collectors. Am J Ind Med 1998;33:463-70. 20. Gruner C, Bittighofer PM, Koch-Wrenger KD. Health risk to workers in recycling plants and on waste disposal sites. Schriftenr Ver Wasser Boden Lufthyg 1999;104:597-609. 21. Ivens UI, Breum NO, Ebbehoj N, Nielsen BH, Poulsen OM, Wurtz H. Exposure-response relationship between gastrointestinal problems among waste collectors and bioaerosol exposure. Scand J Work Environ Health 1999;25:238-45. 22. Wouters IM, Hilhorst SK, Kleppe P, Doekes G, Douwes J, Peretz C, et al. Upper airway inflammation and respiratory symptoms in domestic waste collectors. Occup Environ Med 2002;59:106-12. 23. Douwes1 J, Thorne P, Pearce N, Heederik1 D. Review: Bioaerosol health effects and exposure assessment: Progress and prospects. Ann Occup Hyg 2003;47:187-200. 24. Wiszniewska M, Swierczyriska -Machura D, Cezary P, Walusiak-Skorupa J. Fungal allergy among art conservators: Prevalence, risk factors and clinical symptoms. Med Pr 2010;62:133-41. 25. Emar AM, Abo El-Noor MM, Hassan NA, Wagih AA. Immunotoxicity and hematotoxicity induced by tetrachloroethylene in Egyptian dry cleaning workers. Inhal Toxicol 2010;22:117-24. 26. Patiwael JA, Vullings LG, de Jong Nw, Van Toorenbergen AW, Gerth van Wijik R, de Groot H. Occupational allergy in strawberry greenhouse workers. Int Arch Allergy Immnol 2010;152:58-65. 27. Jang JH, Kim DW, Kim SW, Kim DY, Seong WK, Son TJ, et al. Allergic rhinitis in laboratory animal workers and its risk factors. Ann Allergy Asthma Immunol 2009;102:373-7. 28. Nagendran V, Wicking J, Ekbote A, Onyekwe T, Garvey LH. IgE- Mediated chlorhexidine allergy: A new occupational Hazard. Occup Med 2009;59:270-2. 29. Hur GY, Koh DH, Kim HA, Park HJ, Ye YM, Kim KS, et al. Prevalence of work -related and serum-specific antibodies to wheat flour in exposed workers in the bakery industry. Respir Med 2008;102:548-55. 30. Chattopadhyay BP, Das S, Adhikari A, Alam J. Exposure to varying concentration of fungal spores in grain storage godowens and its effect on the respiratory functions status among the workers. Ind health 2007;45:338-461. 31. Bunger J, Antlauf-Lammers M, Schulz T, Westphal G, Muller M, Ruhnau R, et al. Health complaints and immunological markers of exposure to bio-aerosols among bio-waste collectors and compost workers. Occup Environ Med 2000;7:458-64. 32. Vrijheid M. Health effects of residence near hazardous waste landfill sites: A review of epidemiologic literature. Environ Health Perspect 2000;108101-12. 33. Goorah SS, Esmyot ML ,Boojhawon R. The health impact of non-hazardous solid waste disposal in a community: The case of the Mare Chicose landfill in Mauritius. J Environ Health 2009;72:48-54. 34. Coenen GJ, Dahl S, Ebbehoj N, Iven UI, Stenbaek EI, Wiirtz H. Immunoglobins and peak expiratory flow measurements in waste collectors in relation to Bioaerosol exposure. Ann Agric Environ Med 1997;4:75-80. 35. Marth E, Reinthaler FF, Schaffler K, Jelovcan S, Haselbacher S, Eibel U, et al. Occupational health risks to employees of waste treatment facilities Ann Agric Environ Med 1997;4:143-7. 36. Skorska CZ, Mackiewicz B, Golec M, Cholewa G, Chmielowice-Korzeniowska A, Dutekiwicz J. Health effects of exposure to organic dust in workers of a modern hatchery. Ann Agric Environ Med 2007;14:341-5.